Most of the questions about my last post were: “Who is Ramon?”. This is a good question, since I put him in a picture, said he was wonderful, and said nothing else. Ramon is my Fulbright ETA sitemate. He is from Los Angeles, and he has been instrumental in my survival here in the BLT. He also helped coin the term BLT. He is very important. He teaches at SMA 7, a regular college-prep high school in a more suburban part of town. Ok. I thought I would get that out of the way before delving into my newest post. Ramon approaches gracefully from the distance. In Kemiling, Ramon’s neighborhood. Since my last post, I have done even more conspicuously bule* (white person/foreigner/WEIRDO) things. These feats of bule-ness go above and beyond sitting at Starbucks. As the title suggests, in the past few weeks I have been grappling with the difficulty of becoming a normal human here. I have concluded that the grappling was unnecessary, because I will never be a normal human here. I just need to embrace my inner bule, keep on trying to do my job, make new friends, and move on. It has now been more than a week since I taught a class. Last week was midterm testing, and today I am still getting over a really nasty stomach bug that kept me in bed for most of the weekend. So, I’m feeling a little rusty in all regards. I hope my return to the classroom is graceful! I need to summon Miss Selin from wherever she has gone over this last week of laziness and sickness. I moved into my new digs at Rumah Puspita, a Kosan Especially for Princesses (my translation of the sign at the entrance)! My room is a (very) little but very much appreciated slice of privacy in my life. My neighbors are all in their first semester of university, so I’m a good bit older than everyone here. My kosan friends are very enthusiastic about practicing their English with me. 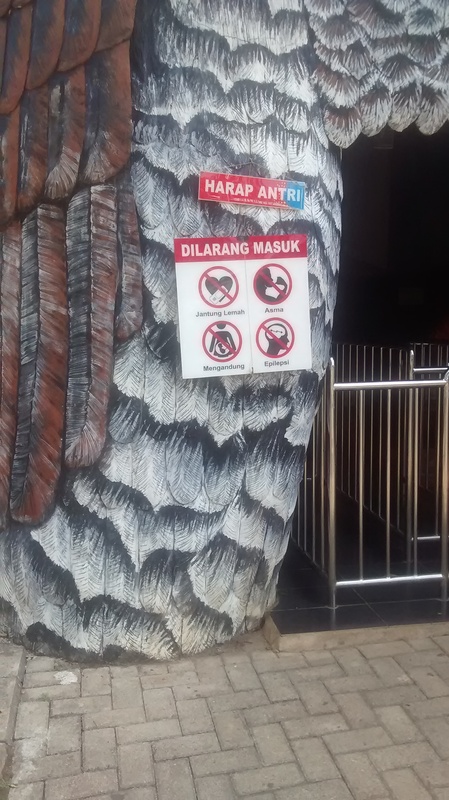 I’ve generally found over the last couple of weeks that I’ve had fewer and fewer chances to practice Bahasa Indonesia as the anglophiles of Bandar Lampung stake their claims on my free time. I live on the first floor. You can’t see my room. hahaha. 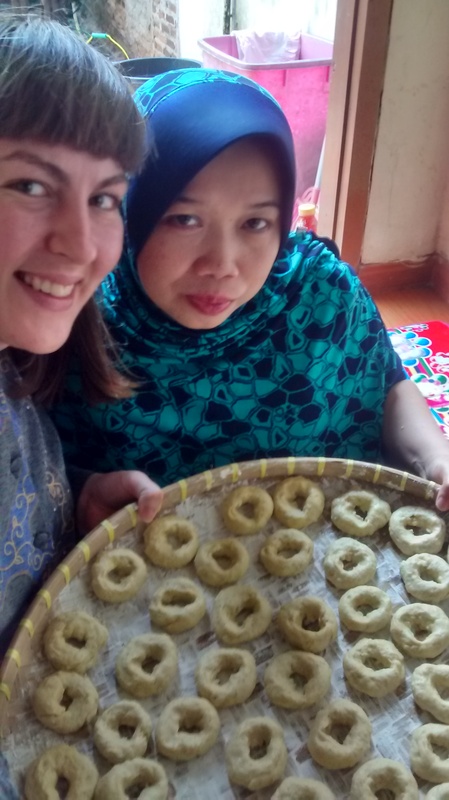 I learned to make Lampung donuts (with potato and coconut milk and LOTS of MARGARINE) with another teacher from my school who is an incredible cook. She has offered to teach me the ins and outs of Indonesian cuisine. The donuts were REALLY good. This coming week’s lesson: pempek (chewy fried things that are usually made out of fish, but she says we will learn to make them out of papaya!). I taught a few lessons on simple present tense and giving complements using the song “I like it” by DeBarge. While it only resulted in an effective lesson in 2 out of 4 classes, it resulted in class-wide falsetto crooning and giggling every time. 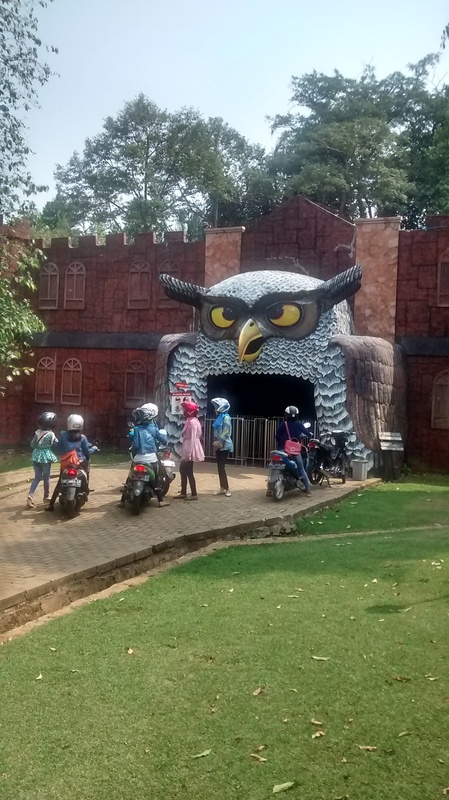 I went to Lembah Hijau (Green Valley) a water park/haunted house/conference resort/zoo/aquarium/basically anything awesome in the hills near Ramon’s neighborhood. This place was off-the-charts AMAZING! Its cleanliness was ASTONISHING! Trash is one of those things I could probably write a whole post about. But I’ll save that for never. Because that would be a negative nancy post. 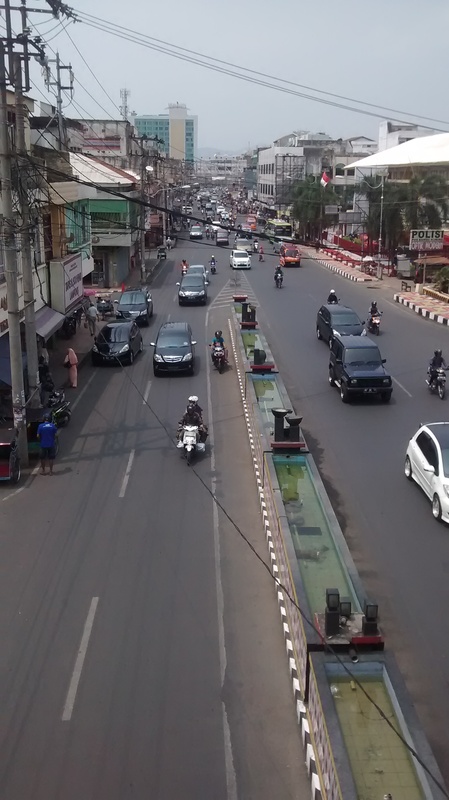 Downtown Bandar Lampung. I took this from a very rusty metal pedestrian bridge. I lifted this from Mbah Google (grandma google, as the president of my school’s English club says). 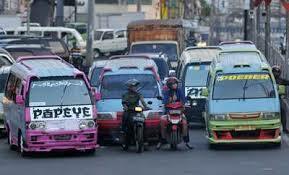 These are BLT angkots, which are undoubtedly the most pimped-out in all of Indonesia. On the way to meet up with Ramon, I took the angkot (public transit bus) solo for the first time. Of course, I didn’t do it right. I ended up somewhere outside of the city limits before I realized I was on the wrong bus. Knowing how to take the angkot is a feat of great knowledge and understanding. There are no schedules and no maps; the buses come in a handful of colors which denote the route that they take. However, there are some variations within the color-coded routes. In these cases, the only way to know where you will end up is by asking the driver. I didn’t know this when I got on the green angkot to Kemiling. I was on the green angkot for a very long time. This particular angkot didn’t even have a sound system (usually a huge, long-ago-blown-out subwoofer at the back of the bus), so it felt even longer. We even stopped for an old woman’s entire grocery shopping outing. Eventually, I started to notice that I was no longer in a city. At that point, I asked all the ladies on the bus when we would get to Kemiling. 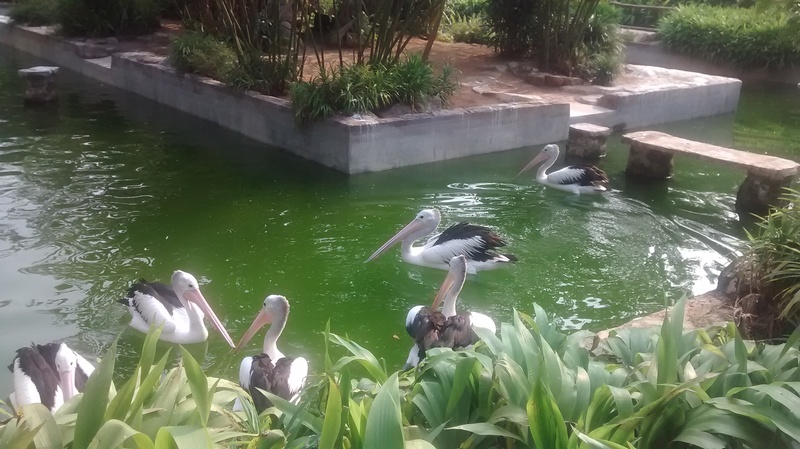 And they were like “You poor, confused creature, we passed Kemiling a very long time ago”. I called Ramon, and learned about that very important step in choosing an angkot: asking the driver which Kemiling route he is following. 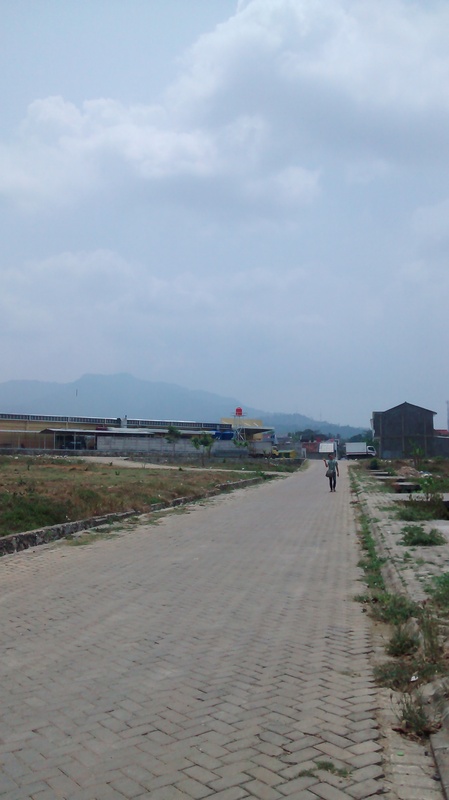 So, I got off of the angkot in the middle of nowhere, crossed the road, and waited for one coming back towards town. I was quite the spectacle, standing alone by a busy road in the far outskirts of the city. When I finally made it to Ramon’s neighborhood, we took motorcycle taxis (terrifying!!!) to Lembah Hijau. It lives up to its name. It is very green, and it is a valley. We paid just under 10 USD each for admission to the park, a haunted house, an aquarium, a very nice zoo, and admission to WATERBOOM. It was an ideal day of jalan jalaning. It was also a Thursday, so there was no one there. We were the only people in the entire water park area. very dangerous. very scary. very haunted. Text-wrapping/photo-formatting is essentially impossible on WordPress. 5. 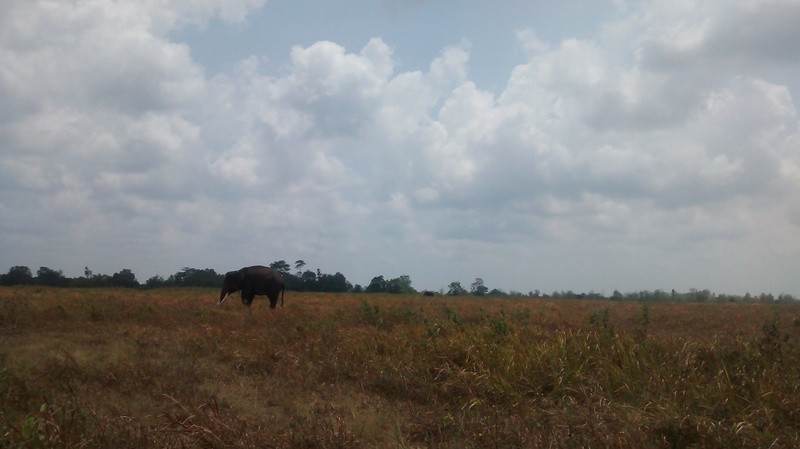 I went to Way Kambas National Park, a very cool hangout spot for Sumatran elephants. 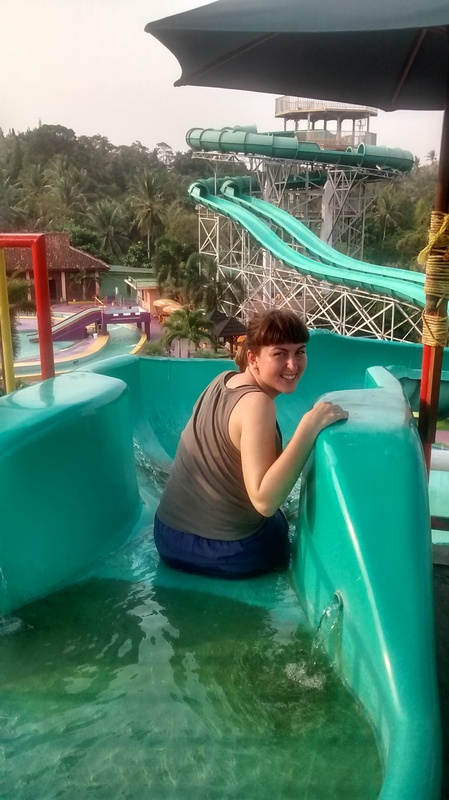 I’m very happy I went, but it probably was not a great idea to embark on a 3 hour road trip on bumpy Indonesian roads after having spent the previous night vomiting. I thought the worst was over. I had no idea. In the closest town to the entrance, we picked up Atu Christin’s (my “aunt”‘s) friend, who works in animal husbandry. He got us into the employees-only section of the park for free, so we got to see elephants in their natural habitat instead of just at the sad tourist performances. We did get a performance, though. Of the 300 elephants living in the park, about 50 are trained. Each trained elephant has its own handler. 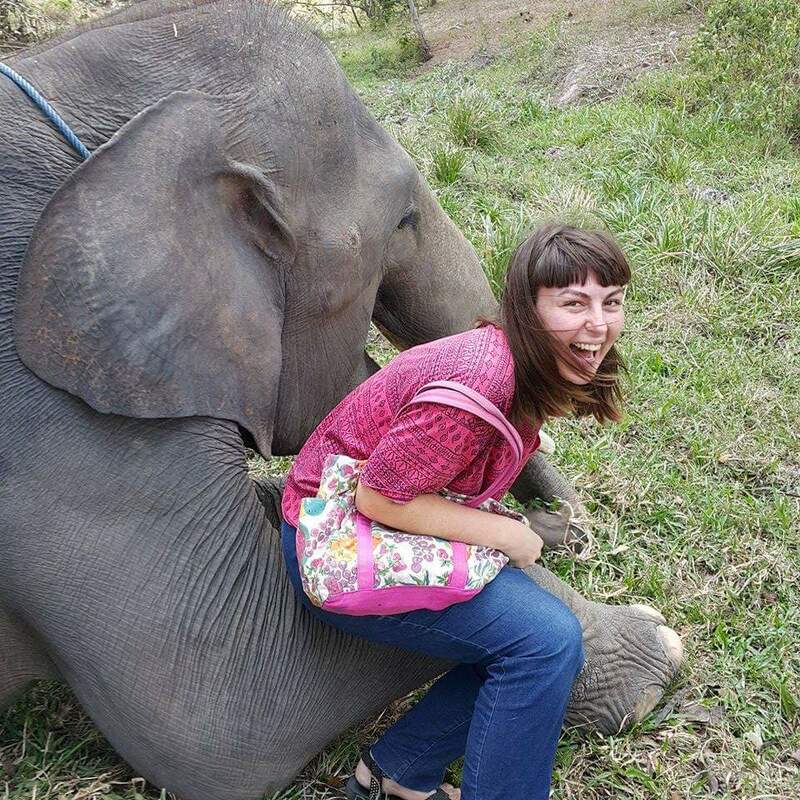 One of the handlers really wanted us to take pictures sitting on his elephant’s leg. So we did. On the way home, I vomited a lot. Then, I spent the next two days in bed. I wrote most of this post after two days of not eating anything, so forgive me if it is all over the place. *While I am embracing the bule aspects of my personality, I am not embracing the word bule, which I find profoundly annoying. It is annoying not only because approximately 4 out of every 10 car/motorcycle passengers shout it at me as I walk down the street, but also because I think it plays into the politics of whiteness that is all the rage here in Indonesia. What is happening!?!?! Global whitewashing of beauty! Everyone I see on TV and billboards is uniformly pale, slender, and narrow-nosed. Whitening creams are everywhere, and my students are perpetually pointing to each other in class and saying, “Miss, this is black man, Haha!”. I usually just ignore all of the comments, but I wish that this nation of incredibly beautiful people wouldn’t look to frumpy, sweaty Rebecca as a beauty icon just because of my pointy nose and “white” (read: perpetually reddish and sweaty) skin. I don’t think there’s anything I can respectfully do, as an outsider, to combat this. Do any of my readers have suggestions? All I can think of is just pointing out similarly twisted beauty standards in America. Posted on October 14, 2015 October 14, 2015 by rebeccajselin	Bookmark the permalink. Well done Bule Beeba! Sorry you were sick. I recently read an article about cosmetic surgery in South Korea and I thought the same as you – what a pity that they aren’t embracing their natural beauty and instead want to all look like the same Westernized ideal. We love reading about your adventures – both good and not-so-good. Hope you’re feeling better! Another great post, Beeba! I ran into similar problems in South America… gringa this and gringa that. This sound more serious though! I have no suggestions, sadly, but keep being the great role model that you are! So proud!!! Rebecca, you incredibly beautiful and not frumpy!! You’re just different than they are! Love your blog, Love you! Hi Rebecca! I have been struggling with figuring out how to combat the twisted beauty standards here too. My students and fellow teachers always come up to me and say “Miss, you are so BEAUTIFUL!” I always tell them that they are beautiful too. I tell them how in America people all want tan skin, and when they comment on my nose I make a joke that I can smell too much with my hidung mancung. Everyone always wants what they don’t have. A couple weeks ago, some boys dragged a slightly overweight girl over to me to say things like “Miss! She is fat! She is black!” and the like. Everyone laughed, including the girl, but I fixed the boys with the steeliest gaze I could muster, grabbed her hand, and asserted that she was beautiful too. I told the boys off for saying things like that, after which they stopped with their antics. Refusing to feed into this kind of activity and directly combating the inevitable group body/skin-bashing that happens here is one of the only things I can think to do. We can’t change everyone’s perspectives here (or in America, where there are skewed perspectives relating to body image too) but we can steer conversations in a positive direction whenever possible. Lastly, if you are doing a unit on describing people I would highly recommend showing your students this video: https://youtu.be/iYhCn0jf46U. In case the link doesn’t work you can find it by Googling “Dove Evolution.” It shows the before and after process of a model so that students can see how far from reality the images that they see in the media are. I showed this in one of my more advanced classes yesterday and it seemed to make an impact, but next time I would probably want to devote more time to discussing the video. Dove (like the soap company) has a lot of positive body image videos that could also make good material for the classroom. Power to you, my Sumatran sister. I hope you are feeling better and living it up in the BLT! YES I will definitely look up that video. I’ve pretty much been given free reign over my lessons so maybe I can do descriptions/beauty standards next week. Thanks so much for such a wonderful, thoughtful comment. Actually, I’ve been meaning to call you because I’m considering maybe meeting up with you in Thailand around Christmas. 🙂 Stay strong, my Sumatran saudara. 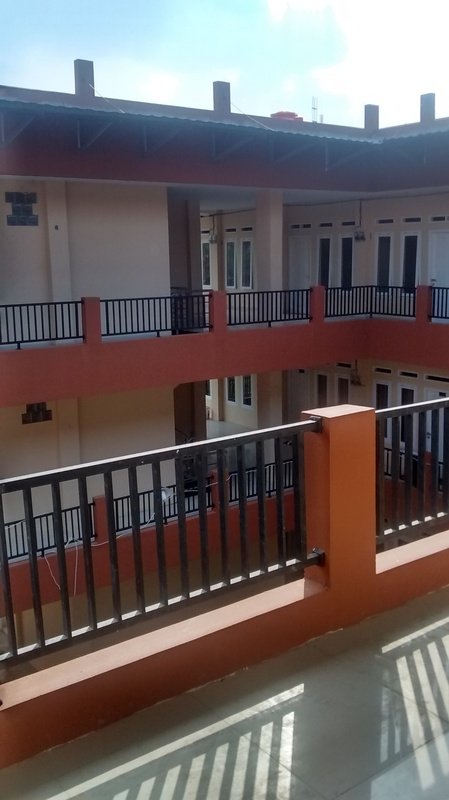 Semangat!